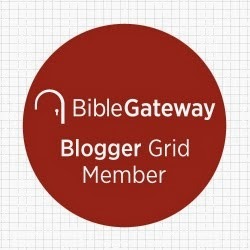 Allan R. Bevere: Those Three Crosses By the Side of the Highway... How Did They Get There? 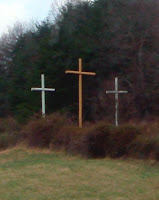 Those Three Crosses By the Side of the Highway... How Did They Get There? If you've ever traveled on Interstates 77 and 79 through West Virginia, Interstates 77 and 81 through Virginia, Interstate 64 through Kentucky, or I-40 to Statesville, then you have probably wondered about the repeating sets of three crosses. They are the visual remains of one man's dream, a vision to build "crosses of mercy." Often tucked away in farmer's field or strategically placed on a hilltop pasture, many of Bernard Coffindaffer's original crosses still stand today, representing the crucifixion of Christ and the two thieves at Calvary. The two smallest crosses in each set are painted the lightest blue to represent the earth, while the third, tallest cross is pale yellow, which represents royalty. They were designed to last 35 years, built with California Douglas fir and coated with a saline solution. The first set was built near Flatwoods, W.Va., and there were 1,864 sets planted in at least 27 U.S. states, the District of Columbia, Zambia and the Philippines. In North Carolina, 106 sets were planted, the seventh highest total behind West Virginia (352), Florida (225), Ohio (158) Mississippi (156), Georgia (144) and Virginia (131). Born in Craigstown, W.Va., on Jan. 27, 1935, Coffindaffer lost his parents at an early age. Despite this emotional hardship, he went on to graduate from high school at 14 and from the University of Charleston with a degree in business. He started a coal-washing business in the mountains of West Virginia and created a coal-cleaning system that he patented. It made him a millionaire. However, Coffindaffer had struggled with his health for years. He was overweight, had diabetes and had endured two heart bypass operations. He liquidated his business in 1982, and, in 1984, had a vision. "A genuine, marvelous, glorious vision," he said, according to Sara Abraham of Crosses Across America, who has meticulously transcribed his handwritten notes. "The Holy Spirit instructed, blessed, dealt with me and told me how to go about installing the crosses. It was an experience you have once in a lifetime."